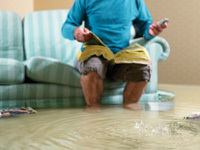 (NC)—Many homeowners are surprised to hear that water damage is the most common insurance claim. Water damage—often in the form of a flooded basement—can come out of nowhere and cause extensive damage to the house. According to the Insurance Bureau of Canada, there are many circumstances that can cause a flooded basement, including tree roots growing through cracks in the waterline, overloaded stormwater and sanitary sewer infrastructure, frozen pipes, vandals blocking lines and more. When you leave home for more than three days, make sure you have someone come and check the premises. A flooded basement, leaky pipe, or a broken window can be devastating if it is not discovered immediately. It may seem simple, but many homeowners need to be reminded to keep their basement drains clear of obstructions. That means moving large objects such as furniture and making sure the drain is not sitting under a layer of dirt or debris. In older houses, drains may need to be snaked to ensure they can do their job properly. This will greatly reduce the frequency and severity of basement flooding. Backflow valves or plugs can be installed on drains, toilets and other sewer connections to prevent water from entering the home. The 10 minutes spent on inspecting your home for items that are in flooding prone areas could save hours later. Make sure you store important documents and irreplaceable personal items where they will not be damaged.